JACKSON— When General John Hunt Morgan defied orders and brought his Confederate “Raiders” across Indiana and southern Ohio in 1863, life changed drastically in these parts. “Hide The Horses” chronicles some of the ill effects on local citizens. The original script, written by Dr. Jack Hart, and based on Robert E. Ervin’s book, will premiere this Saturday, August 22, at 8:00 p.m., at the Markay Cultural Arts Center, 269 East Main Street, Jackson. Dr. Greg Miller is both directing and acting in the play. Miller is being assisted by Mindy Hager in cooperation with the University of Rio Grande and the Morgan’s Raid Reenactment Committee. Tickets are $15 each and may be reserved by calling the Box Office at 740-577-3841. 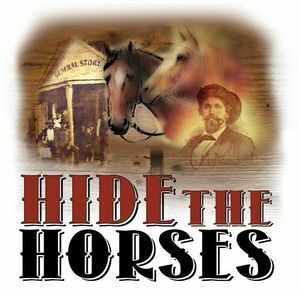 RIO GRANDE — Auditions are set for July 16 for the play “Hide the Horses” a drama about folks in southern Ohio reacting to the approaching Morgan’s Raiders in 1863 during the Civil War. The play is written by Dr. Jack Hart, professor of English at the University of Rio Grande. Dr. Greg Miller, professor of Fine Arts at URG will be heading the production along with Mindy Hager. The auditions will be 6 p.m. July 16 at the URG Performing Arts Center in Rio Grande, with first read-through of the play at 2 p.m. July 19 and rehearsals from 7-8:30 p.m. July 20. This play is being presented in collaboration with the Morgan’s Raid Re-Enactment Committee and the University of Rio Grande. The play will debut Aug. 22 at the Markay Theater in Jackson, Ohio. The play will be presented at other locations on future dates. For more information, contact Greg Miller at 740-645-6306.